UNION leaders are to step up their fight to stop Plymouth City Council selling off Citybus, writes Political Reporter Keith Rossiter. Unite, the union, will be sending representatives to Monday's meeting of the full city council – and to all scheduled council meetings in Plymouth in the future. A spokesman said they had already collected 15,000 signatures on a petition opposing any sell-off. The union has expressed fury at the council's decision to invite bids for Citybus. It fears that a sale would mean jobs being lost, and that there will be a reduction in services to the community and a number of routes lost. "We have a 15,000-strong petition signed by the people of Plymouth showing their support for our campaign. The public are clearly asking the council why they are prepared to sell off their bus service against their will. "As the decision to sell Citybus was made without an official vote from the Cabinet, the councillors are clearly going against their democratic principles. "The bus service provided to Plymouth offers a return of more than £500,000 a year. The council has said that there is a potential financial liability to the council and so must be sold off to the highest bidder. "They have already spent £1million on a feasibility study, which is an insult to the Plymouth taxpayer." A Plymouth City Council spokeswoman said: "This is absolutely not true. Project costs have been estimated at just under £1million. But this has not yet been spent. It does seem that people in Plymouth are behind the Union. Certainly the supporters of Citybus are a lot more vocal than those in favour of a sale. "Its important to explain Citybus is a private company although the council owns it as a majority shareholder, we do not run it. CityBus is a commercial business in its own right and that would not change if a sale were to take place. It would simply be a change of ownership. The city would still need a bus service. " It is interesting that the investment in new buses should be seen as a risk. Citybus has been investing in new buses over the years and now has a mostly low floor fleet. There are still quite a few step entrance buses left but it does seem to be on target to get them all replaced within the time scale required. As a private company owned by the council the operator will have plans in place to achieve a low floor fleet. Is it really such a risk to the taxpayers of Plymouth to continue to buy new buses? Citybus has a community-based ethic and will run buses on routes that have a profit margin of 4-6 per cent, where a national company will not run a route that makes less than a 15-21 per cent profit. To continue running these services after the sale of Citybus the council will have to subsidise them. 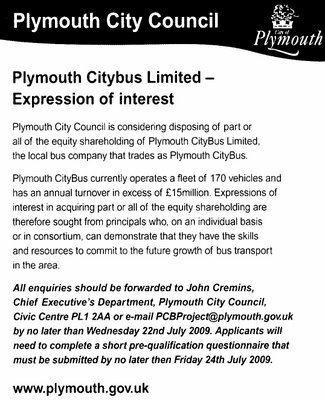 I believe that Plymouth City Council will be putting between £1.6 and £2million per annum into subsidising the new bus company. If Citybus is sold for £10million then the sale will only generate enough cash to sub the new company for five years. That doesn't sound very good business practice to me. Now I am not so sure about her sums in the second half of this statement but she does have a point with the first half. The big groups do have expectations of their local profit margins and we are seeing services being cut across the country as the groups strive to ensure local fleets meet their targets. Some of the gap can be made up by the purchasing power of the bigger groups and if First were to take over then there are savings to be made by joining the operations in Plymouth, but if the assumptions above are correct that would still leave some services looking vulnerable. "If we were to take any action like a strike it would make the public turn against us," Andy Gibbons, the chairman of the Citybus branch of Unite union said. "We might consider a strike as a last resort when they decide to sell Citybus to show that we are against it," Mr Gibbons said. They have now collected over 17,000 signatures! Council leader Vivien Pengelly told the full council yesterday that her party had changed its policy on Citybus because of the recession. Challenged by Labour's Bill Stevens over whether the sell-off was in the Tory manifesto, Mrs Pengelly said: "Your Prime Minister said there would be no boom and bust. But things have changed." The whole battle here is very much along party political lines which I cant help but feel is unhelpful. The Liberal Democrats criticise the Conservatives for trying to sell but also criticise Labour for not doing any better when they were in control. Mrs Pengelleys point about the recession is a valid one. Looking at the national picture it is very clear that the Government are looking at selling assets and encouraging local authorities to do the same to help raise cash. I cant help feel that if we had a Labour council at the moment we would be having the same argument, just the other way round.